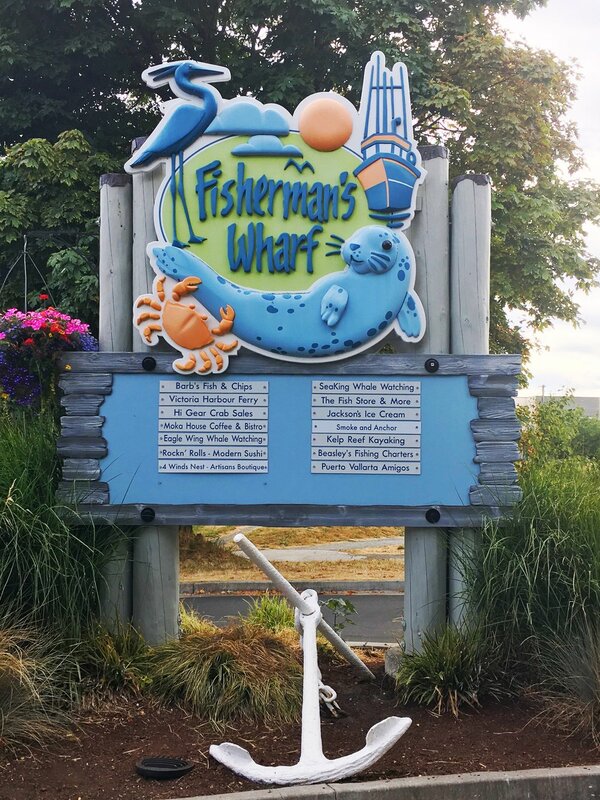 Not far from downtown Victoria, which is dotted with hanging flower pots and adorned with very nearly British buildings, is Fisherman's Wharf. Fisherman's Wharf is a working wharf lined with several restaurants and a single boutique shop. The most notable feature of Fisherman's Wharf is that people actually live here - in floating homes! These 33 floating homes are moored alongside the pier, just like you would moor a boat. The houses float on old wooden barges, cement bases, or metal pontoons. They are, without a doubt, the tiniest, most quaint homes in Victoria. The homes range from 500 to 1500 square feet and while some homes have second floors, many are only one story. They range in size from multi-storied complexes to life-sized gingerbread houses. Just like boats (except these homes don't have engines attached), the owners pay moorage every month to the Greater Victoria Harbour Authority. They pay property taxes just like everyone else (fun fact: the waters surrounding Canada are still owned by Her Majesty, The Queen!). And the homeowners pay sewage and heating costs; hoses beneath each house pump sewage to the main city sewage system and heat is provided by propane fireplaces or electric heaters. The homes are actually inexpensive by Victoria standards due to the recent housing crisis that has been plaguing the oceanside city. Housing costs have soared, leaving families, students, and seniors struggling to keep up as student loans and salaries lag behind. At Fisherman's Wharf, the most recent home sold for $340,000 and homes are rarely listed for more than 24 hours before being bought for its asking price (or more!). All 33 homes are currently occupied and homes are not put up for rent. Many of the houses are distinct in nature, painted with bright colors and decorated with flowers, flags, and gnomes. One house is painted bright red with a pair of huge Canadian flags flying dockside. Another house has yellow trim, a white lifesaver hanging neatly beside the door and a kayak tied beside the plastic foam blocks the house is floating on. Polite signs posted on or by the houses say "Private!" As hoards of cruise ship passengers weave in and out of the wharfs holding dripping ice cream cones, it's easy to spy a small dog in the window of a home or a local relaxing in his living room. Like it's totally normal for strangers to be passing by on a Wednesday afternoon. But these homeowners also share their front yards with ferries, kayaks, fishing boats, and sea planes. The outdoor restaurants - which are also floating! - sell everything from sushi to smoked meat to gelato, but the most popular place to eat is by far Barb's Fish and Chips. The line snakes around the corner, but it's worth the wait. The fish truly are crispy on the outside, buttery on the inside, and just downright delicious. 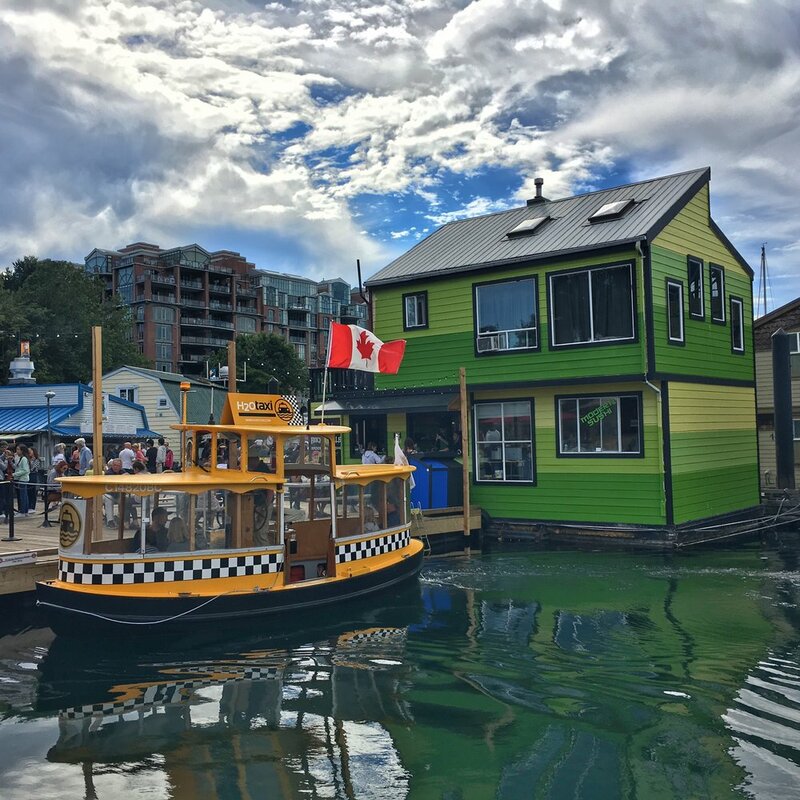 Fisherman's Wharf was a perfect afternoon spent in Victoria - just another reason to visit! 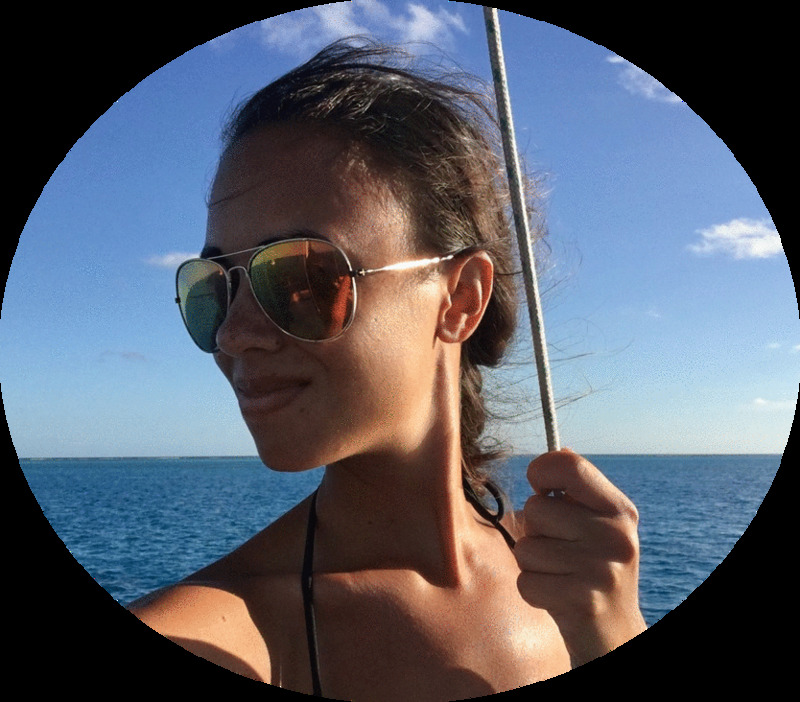 Where to stay: I stayed with a friend, but check out HI Victoria and Ocean Island Backpackers Inn for rates between $24-28USD/night. How to get there: Victoria is located on the southern side of Vancouver Island. From Vancouver's ferry terminal, you can take a 1.5 hour ferry ride with BC Ferries for $17.50CAD one way. Or take a 30 minute flight from Vancouver's airport. Be aware that both Victoria's ferry terminal and airport are on the other side of the island, so you will need to take a cab or bus into town. Worth the travel, though!